"in iz inVnSeiSn" - is the lack of "h" here intentional do you think? Also, was it common to distinguish /I/ and /i/ by the length only (and thus write "i" and "i:" instead of "I" and "i:")? 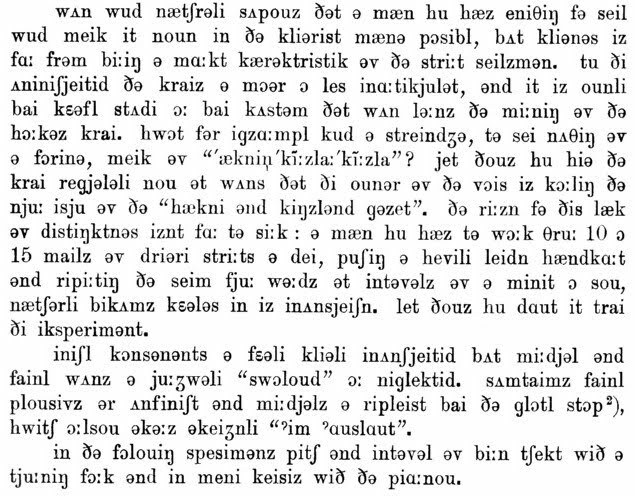 There are some other interesting renderings as well, eg the r in nætʃərli (natur'lly?) and some others I already forgot. The note about German Jews is really strange. German Jews didn't live there anyway, but even if he meant Jews who speak "corrupted German", ie Eastern European speakers of (Eastern) Yiddish, why on earth would they have a glottal stop for an intervocalic t, or even glottalise it? It's "in iz inVnsjeiSn" (and incidentally VniniSjeitid, which is also interesting in the context of John's observation about the ə in the endings -less and -ness). And I'm sure the lack of "h" here is intentional. It seems that for most of my life it's only been elocutionists who said "hiz" in that sort of context, i.e. without emphasis. Nowadays of course, things may be more polarized between educated "hiz" and uneducated "iz". I get the impression the h is being dropped less in hij and hem in Dutch too, no? You will observe I have kept the i for I. That was quite usual for a lot of my life too, though I remember one of the first books I read by Daniel Jones, but not which one, having a special transcription, with the iota ɩ for ɪ and closed omega ɷ for ʊ which were used then, but otherwise I think the current symbols, for speakers who lengthened their short vowels for various effects and therefore needed to have them marked for quality as well as quantity. I'm not at all convinced that the criers were indistinct because of boredom and carelessness. I would suggest rather that it is because they were singing — however unmusically. The crier's task is to produce a short stretch of sound which is loud and recognisable. The loudness comes from open-throat resonance, the recognition by a consistent pattern of vowel sounds, pitch and pitch movement. Consonants contribute little — until such time as the singer/crier decides to add linguistic communication. Many pub singers show the same indifference to communicating the text, while striving to get the tune right and, if possible, the vowel sequences. My earliest memories are of the 1940's. By then the only regularly heard cry in the streets of Nottingham was a descending note progression with oʊ on the higher pitch and u: on the sustained lower note. I eventually came to realise that the cry was Post! News! (or possible Post and News!). But that was redundant information; the man would be standing by a pile of newspapers with one in his hand. The purpose of the cry was merely to attract the attention of anyone who might want to buy a paper. Street cries may have disappeared, but the idiom lives on where pub landlords call time. The pitch and melody are constant from night to night, and nobody minds if the consonants — or even the odd syllables — are swallowed. 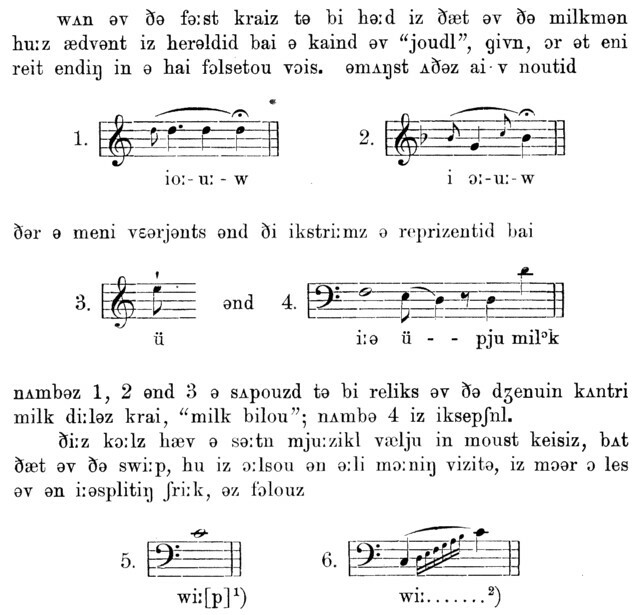 For the notation of English vowels see my discussion at http://www.phon.ucl.ac.uk/home/wells/ipa-english-uni.htm, §5. @Lipman: I wouldn't be surprised if the reference to "the German Jew" (note the use of the singular) is the result of xenofobia or latent racism. It seems an easy conclusion to make ("1: use of glottal stop. 2: invasion of Jews. Conclusion: " etc. 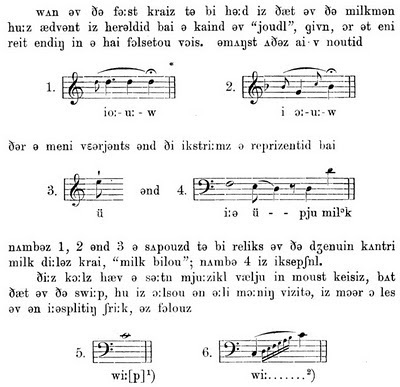 ), although a strange one by a linguist. @mallamb: It is not that I would expect the /h/ to be there in pronunciation, but for the most part the transcription seems rather phonemic, not phonetic. As for /h\/ being dropped in Dutch, we have the clitic forms (or at least contracted forms) "ie" /i/ for "hij" /h\Ei/ and "'m" /@m/ (or even /@_Xm/) for "hem" /h\Em/. But the full forms retain their /h\/. Kilian, always possible in the most unexpected people, but it might also be a plain lack of knowledge or, somewhat in between, ignorance of what exactly Yiddish is, phonetically and in general, other than the general tendency to distort a "host" language. I concede that the logic of this argument would lead also to the avoidance of the schwa symbol in the goat diphthong [əʊ]. It might well have been better if Gimson had chosen to write it [ɜʊ]. I was tempted to innovate in LPD by using that symbol. I take it you mean the first edition of LPD, but even by then I'm not sure it would have been an innovation. I had a feeling [ɜʊ] was used in the first edition of Collins English Dictionary, and your mention of it sent me straight to my copy of it, but I was wrong. Of course it isn't in any of the other editions I have got copies of either, but even though no dictionary may ever have adopted it, I feel sure [ɜʊ] was around for a bit alongside [əʊ] for RP o in some phonetics literature or other. Does no one else remember that? I can't imagine anyone not thinking any adoption at all of Upton's scheme is an absolute disaster. I couldn't believe my eyes when I first saw the 1995 COD. Actually the ʌɪ looks a bit atavistic too. It reminds me of the SOED's əi. What I was saying was that I seemed to be hearing more hypercorrect-type full forms of hij and hem where I would expect the weak ones than I used to. My question was whether there was any analogy with the educated-uneducated polarization I thought I detected in English. When I was fist in Japan in the 60s I was struck by how fully articulated the Cries of Tokyo were (and how moving: almost an ostensive definition of mono-no-aware). Could the difference between Japanese and English cries be simply a reflection of the incidence of consonant clusters and closed syllables? 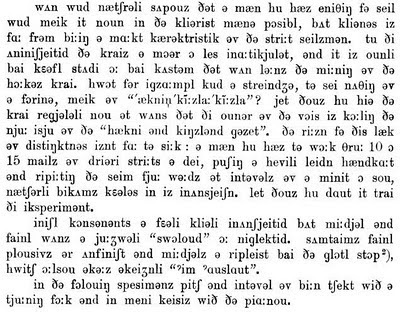 We can tell that Noël-Armfield's lack of h was intentional by his practice in John's first link English Humour in Phonetic Transcript. He consistently represents him as (h)im. And in the first joke he represents latter had as lætə(r) əd with an explanatory footnote. I'm sure you're right about the consonant clusters. Although Tokyo Japanese is a almost up to Portuguese standards for consonant clusters caused by disappearing vowels, such as we were discussing here on the recent "Portuguese" thread, the vowels get reinstated in singing a lot more than they do in Portuguese. But even relatively CVCV cries of English are reductionist. "Any more fares, please?" comes to mind as a mostly CVCV cry which in my earliest youth I saw credibly parodied somewhere as Erryoarairee. And "any more fares, please?" can notoriously coincide phonetically with "let them off first, please" to give an all-purpose bus conductor's cry, ˈenəmɔːˈfɛ̈ːspliːz or thereabouts. But that whereabouts is a bit more of an approximation to phonation from which to achieve that all-purpose function, isn't it? I was going to say human speech, but thought phonation would be more amusing, but it's just plain wrong on reflection. The length marks usage is interesting; round dots in the text of the article, but the triangular ones in the title. Martin: I think this is just typographical. I'm not sure when it was decided that the dots should be triangular, but it was certainly before 1910. Evidently the printer didn't have triangular length-marks in the type size required for the title. In typewriting, people used a colon, obviously. But printed material has used the triangular dots for over a century.